Boy, the sexual activists were angry once sanity prevailed and SB2279 was defeated in the House. 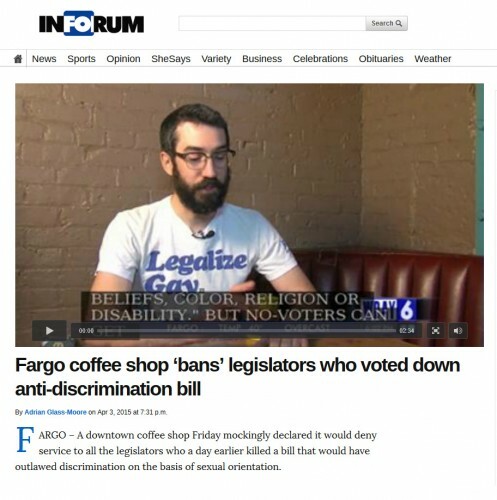 Their social media was replete with f-bombs and the like, and the Fargo Forum group was ready to hop into the action with its inflammatory front page attempting to “shame” legislators who did the right thing. Well, it didn’t end there. Apparently a coffee shop in Fargo decided to have its own tantrum and ban legislators who voted against SB2279. The ironic part is that the same legislators who were banned totally agree with the shop’s right to deny service to whoever they want! That kinda took the wind out of the sails of the movement and proved the point the opponents of SB2279 are trying to make, so the activists had to do a “we were just kidding” backpedal job. The Forum was more than happy to oblige. Too bad for them there’s that Internet. Effective immediately, if you’re among those who voted against Senate Bill 2279 you’ll be shut out completely from the Red Raven. So, which was it – coordinated media effort to keep the agenda plodding forward, or simply sloppy reporting from a historically biased media source? Either the Forum group got it wrong in the first report or they had to help whitewash the ban after that report hit the air. The timeline leads me to believe that this was intentional. The person interviewed at the coffee shop made no mention of it being anything other than a serious ban in the original article despite being quoted four times. The attempt to walk it back came later. The fact of the matter is that the tiny minority of sexually disoriented persons in North Dakota and their vocal activists do not reflect “North Dakota values” as they proclaim, and in fact want a one-way street of discrimination and intimidation of people who don’t think the way they do or condone their choice of behavior or lifestyle. Too bad. They can try to have these little temper tantrums and even get left-wing media to amplify their ranting, but that doesn’t change the fact that individual liberty prevailed this time. This entry was posted in Expository, Media, Politics by Clint. Bookmark the permalink. I’ve been told that “homofascist” is an inflammatory term, so I suppose I’ll back off a little. I tend to have an inflammatory writing style.